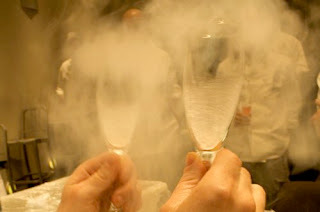 From chilling a cocktail glass, to freezing a carrot so solidly that it shatters upon impact, liquid nitrogen never ceases to amaze, entertain, and allow inquisitive chefs the ability to innovate every day culinary concepts. Recently, The Onion's A.V. Club spent an afternoon in the International Culinary Theater watching a few experiments by Dave Arnold and Nils Norén, who run the Culinary Technology department at The FCI. Ironically, onion ice cream was on the menu. How does one go about making such an unlikely dessert? First you need to pressure cook the onions to make them sweet instead of sharp by cancelling out the sulfur compounds. Next, combine the onions in a blender with crème anglaise and liquid nitrogen. The result is a deliciously sweet and creamy dessert flavored by just a hint of onion. Check out the video and read the article here. Want to see what else you can do with liquid nitrogen? Check out Cooking Issues, The FCI's "tech n' stuff" blog and stay up to date with the culinary innovations of Dave and Nils.